Is it worth it? Yes, they are cute and free! I tried doing the “play with food” option in advance, but when I go back to the game to finish the previous action (Search for soft food), the baby is no longer doing anything and.. The high chair is now inverted, facing a wall. My baby is stuck..
Have you tried restarting your device to see if this fixes the issue? If that doesn’t work can you move the high chair? Can i start an objective of a quest in advance to save time? On my posts it says next to the goal (can be started early) if it can be started early, the only goal in this post that can be started early is Play with food. I accidentally cleaned up the trash instead of clean up after infant. Is there a way I can try again? Is there not another trash can at that house to clean up? you still can do the actual task by kicking over the trash can again. Hey!! 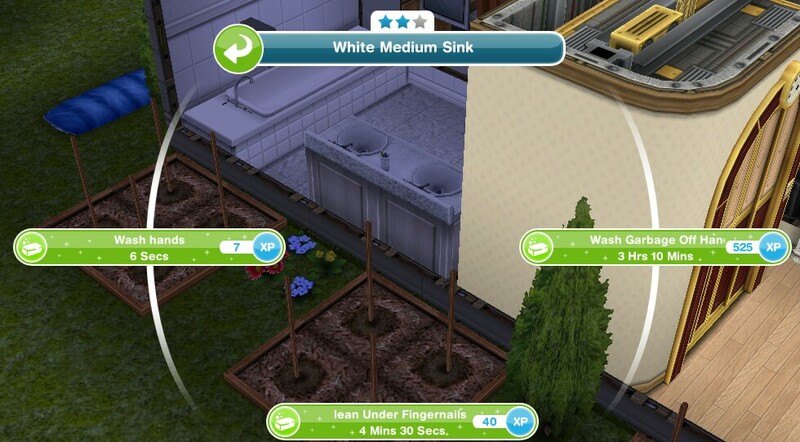 I love your site and refer to it ALL the time when I need help on Sims. I was just wondering if you know how to get the baby to knock over the garbage can? I think the game glitches and now I can’t clean up the mess. Any ideas? Thanks! 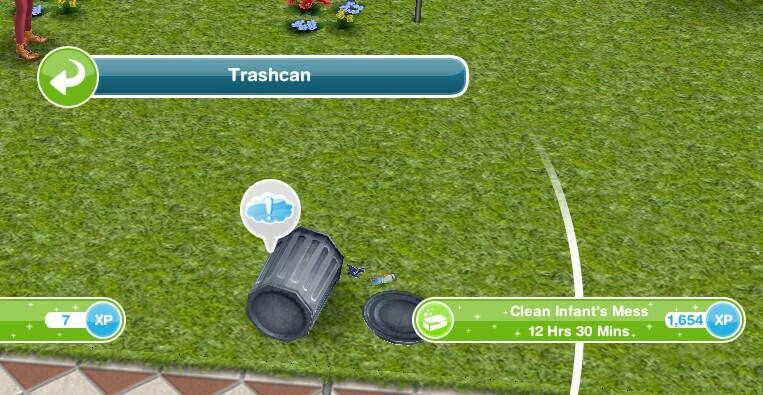 Have you tried getting an adult sim to knock over the garbage to see if you can then clean up the mess? When I finish the last task the time limit is going to be over by a minute or so, will I still need to speed up the task even if it is only a minute? Is there any way that I don’t have to use my LP’s? I really don’t know if other people are having this problem of just getting it done in seven days; but to post on sims book took me 16 hrs not 13hrs. Relaxing with an infant took me 18 hrs not 15. By the way you unlock the xylophone when you complete the quest whether you complete in the time limit or not, again it says this in the post. Where can we find the xylophone gifted ro us? I’ve not long downloaded this game and I know the nanny quest came out last year, so will I still be able to do the quest? By the way, your blogs are very helpful. I’ve read a few of them. 1: In the nanny knows best,do you get some prizes if you don’t complete it in time? You unlock the musical expression hobby even if you don’t complete in the time limit. Ugh…I’m stuck without a nanny! One sim was at work. 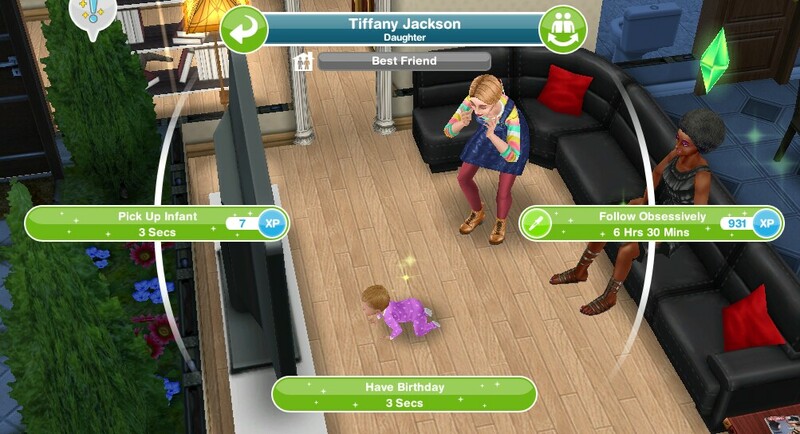 I played the original sims & you could lose your baby to child services if “neglected,” so I didn’t want to send the sim home with the baby to the park. The next thing I knew, the dancers showed up in the park. 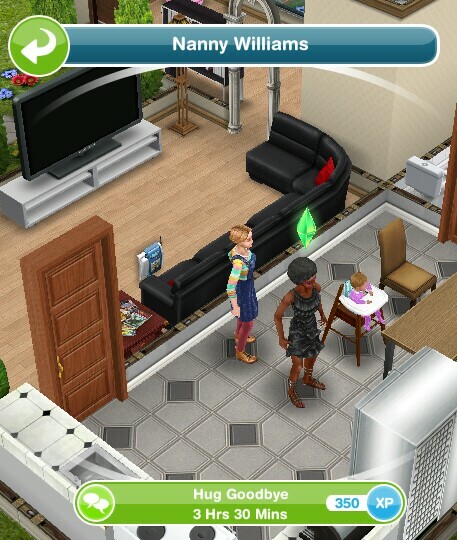 I tried to interact with the nanny, but she needs “undivided attention” & said to finish the dancing quest first. Now there’s a real estate agent and a puppy in the park and I’m still working with the dancers because every single one of their activities takes MULTIPLE HOURS to complete! A 10 hour chat? 19 hours of hibernation? Really?? What am I supposed to do with the baby? The diaper icon is almost empty and there’s nothing I can do to help without the nanny. I can’t stand the idea of using points to speed through the dancing quests. 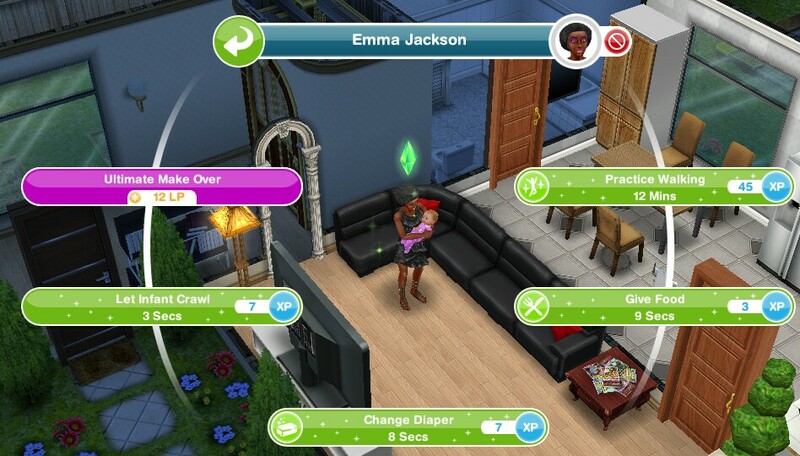 Thirdly, a baby will not be taken away if you neglected it on this game so you don’t need a nanny, just have a sim interact with it when they are free. No there isn’t, you cannot restart quests. Have you tried knocking over the garbage can again and finding the right option? So I started the “search for soft food” and “play with food” like 2 minutes apart and then went to sleep, when I woke up, it said I only completed the “search for soft food” and it won’t let me search again so I can have my baby play with it. so I’m completely stuck here..
Click on a trash can and select the option to knock it over. Even if I’m not up to the part to buy a high hair yet but befor needing to get one I would like to k ow if we it will be available in the children’s store if we didn’t pass the quest to actually get a child? I’m sorry that I forgot the quest. 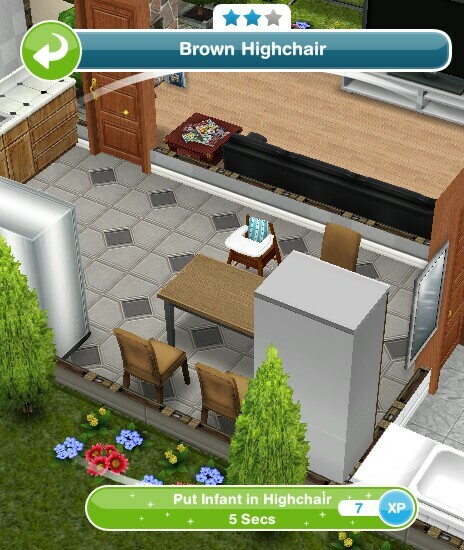 Once you reach the goal in the quest you will be able to buy a high chair, you cannot get the high chair before you get this goal. Is there any way I can complete in the time limit? What do I do if my baby didn’t “update” yet. Like it’s still the same baby form as the older versions? You will need to update to the latest version of the game to see these changes. Hi! A-M-A-Z-I-N-G job on the whole blog by the way! 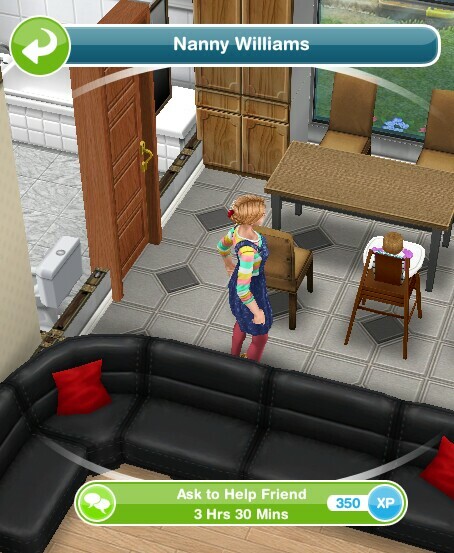 I just started playing Sims Freeplay a few days ago and have reached level 15 following your advice on getting more LPs, and with an extra 100k simoleons on hand! Thanks so much! 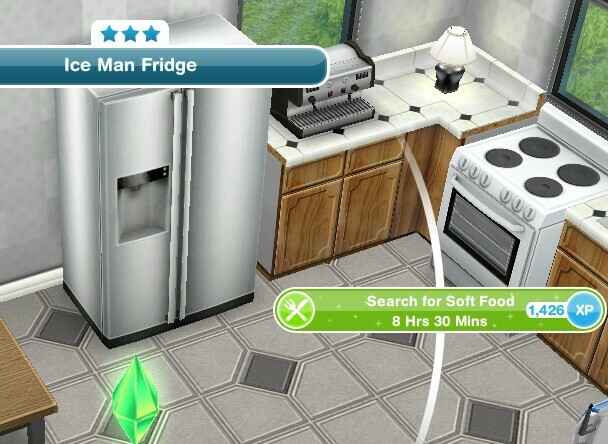 On starting the “Play with food” early, does it mean I start the baby on that activity first, BEFORE I start an adult sim on “Search for soft food in the fridge”, and then come back on the game before the adult finishes? And, I just have to make sure that there is nothing around the highchair, right? To avoid the glitches previous posters have encountered? Excellent advice! That timing would be perfect indeed! Thanks! I am currently doing “Clean infant mess”. I will keep that in mind BEFORE I reach the “Play with food/Search for soft food” goal. Cheers, and more love and power to you! Bookmarked your blog! I did the quest but not in the time limit and I didn’t get the overalls even tho I completed the quest what should I do? The overalls are the time limited prize, if you did not complete in the time limit you do not get the overalls. I clicked on the Nanny as soon as the baby was born, but I did not meet her. Now I can not find a way to meet the nanny. Is she not in the park? 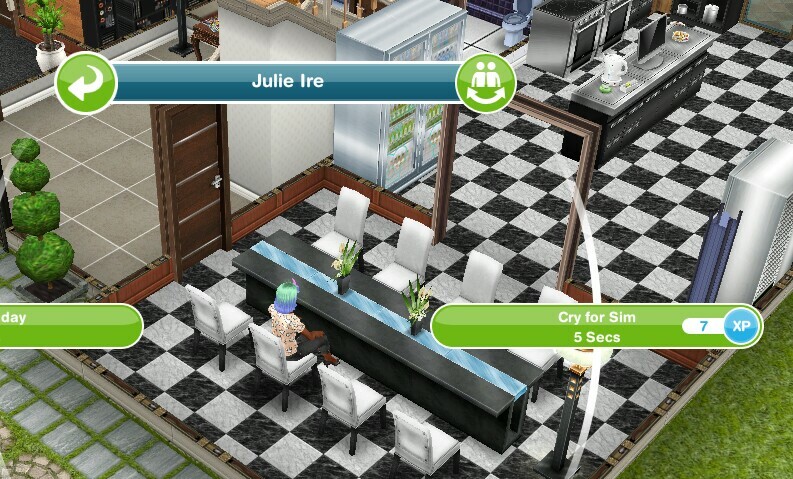 You will need to send a sim there to click on her to get the option to meet her. It should come back again one day, time limited hobby events usually reappear often to give everyone the chance to complete them! I started the Nanny Knows Best quest then turned my baby into a toddler. Do I have to add another baby to finish the quest? 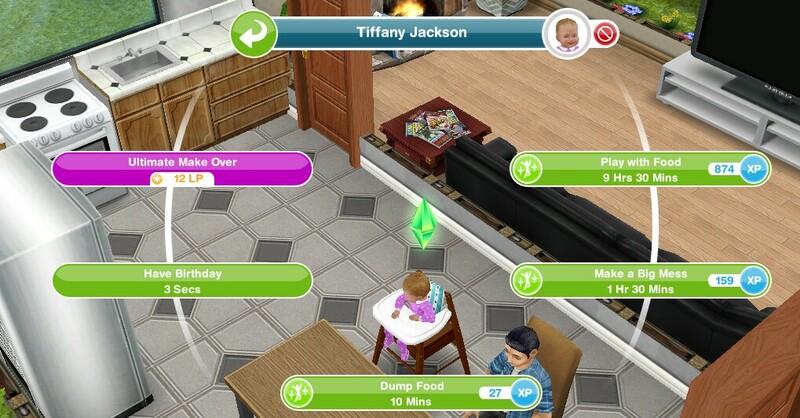 I have a question can I start rocking the infant to sleep early, like while sim I still cleaning garbage up? My baby is showing the toilet in the red. How do I fix that. Would hate to injur may baby. 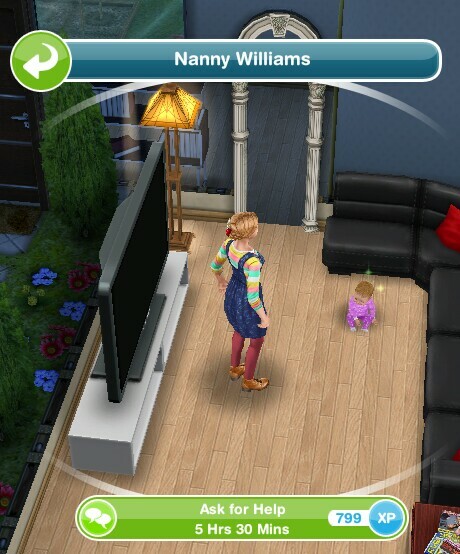 I turned the baby into a toddler before the nanny task was finished! Now it wants the baby to cry for a sim but I only have the toddler. I’m seriously stuck. Will it help to get another baby? Or would that not count? The only way you can complete this is to have another baby then you will be able to finish this quest. You can buy one from the childrens store but everyone has access to the home store. The “post on Simbook” has changed now to 16hours instead of 13. Its crazy there is hardly no time to complete this quest with the time they give you! I have been plaging every day to not miss a minute and now I only have 9 hours left and doing a quest of 16 hours, no way. What a mistake they didnt realize? 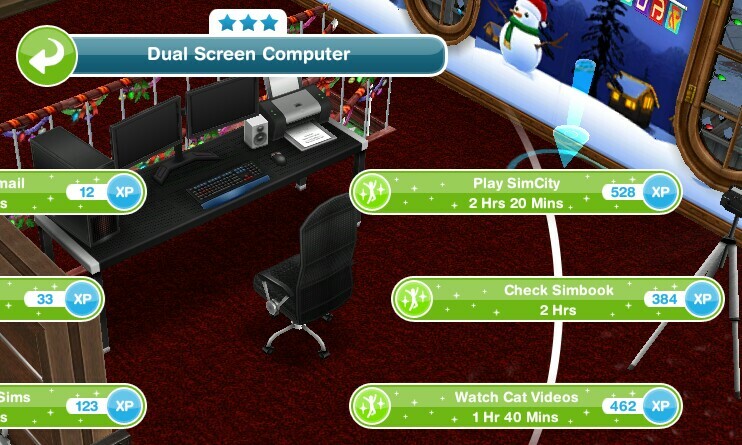 Post on simbook is 16 hours 30 minutes if you use the cheapest 1 star computer, on the 3 star computer it still takes 13 hours. If you are struggling to complete quests in the time limit you may want to invest in some higher star rated items as they allow you to complete actions quicker. I skip Quest “Nanny Knows Best” How do i play this quest. You cannot skip this, you will find the nanny in the park,click on her to begin this quest. Make sure you have a baby in your town first. Uhmm, @weightlessmagic , have you ever heard about the “Baby Onesie” event? It appeared as a quest for me and the only requirement is to complete the Nanny Knows Best quest and I think you will then get the prize after. 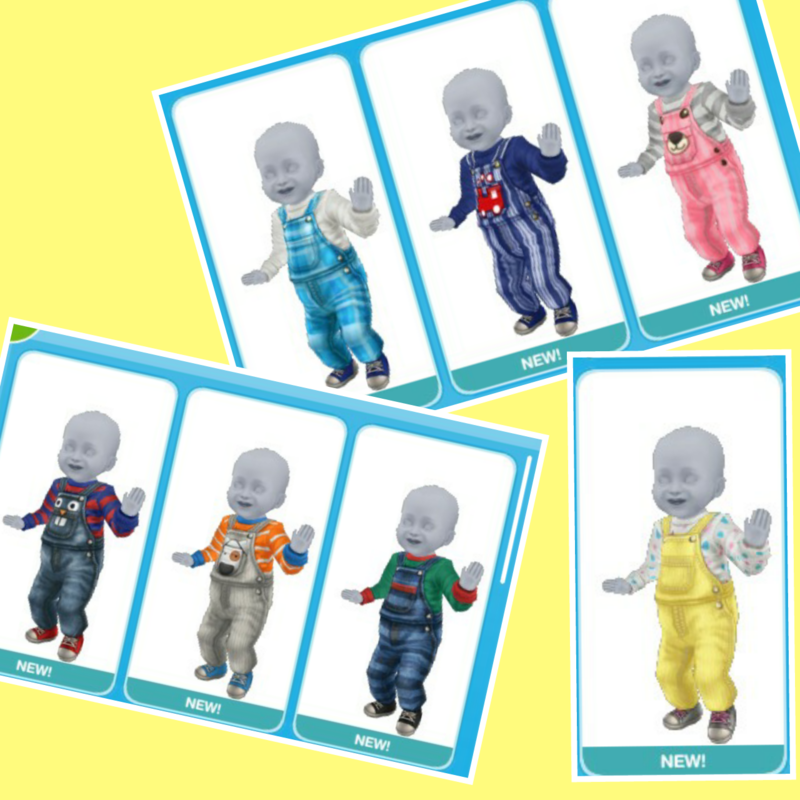 Yes, the baby onesie event is a time limited hobby event that has been available before, the previous post can be found here: https://thegirlwhogames.blog/2016/10/06/the-sims-freeplay-baby-onesie-event-2/ I will create a new post when the event is available again. What will happen if I age my only infant to a toddler during the quest? Will there be a problem like they will prevent me from doing it or something? 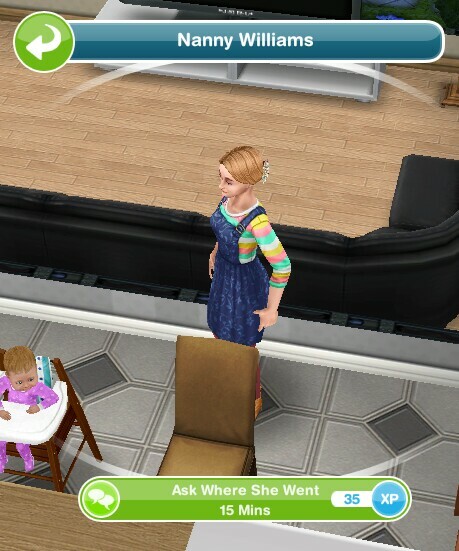 You will not be able to complete this quest if you age your baby to a toddler during the quest. If I don’t finish the quest on time will i still can get the overall? You cannot get the overalls if you don’t complete in the time limit. Yes you do once the quest is complete, you don’t have to complete it in the time limit. What’s happens if I grow my baby to a toddler before the quest is over? You will not be able to complete this quest until you add another baby to your town. Have you reached that goal in this quest yet? 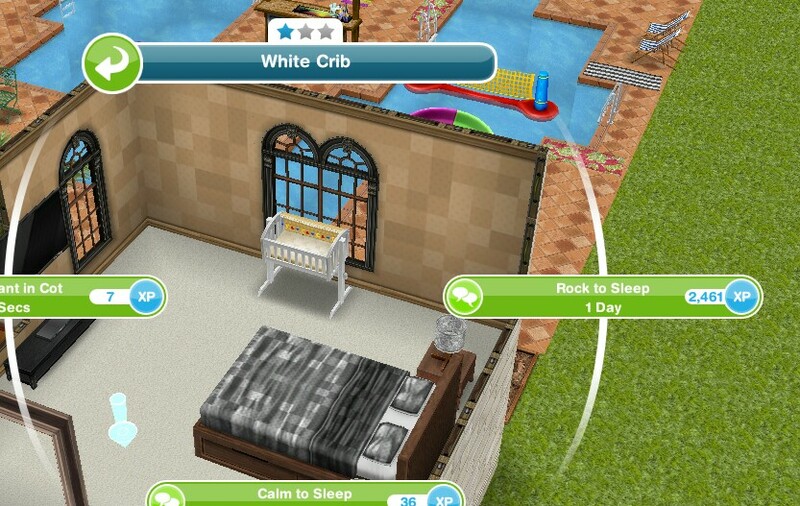 You won’t be able to do it until then, if you have then you may need to rotate the crib so your adult sim can access the right side of it. It actually takes 15 hours to post the pic on Simbook. I completeled this task just now. It takes longer if you use a computer with a lower star rating, a 3 star computer takes 13 hours. I see, I had forgotten about that tip in the game. Could you please include a note about that? It would be helpful to new players, thanks. Sorry but are you saying you started the toddler quest or you haven’t started it yet? I feel like there isn’t enough time alloted for this quest. 5 days!? I’ve been playing pretty religiously (even going as far as setting alarms for myself to mage sure I begin new tasks AS SOON as they become available), and I seem to be cutting it very close. Any tips – other than using LP’s – to get this quest dive in time to receive the limited prize? I have a question about the apartments. Can dogs move in to the lofts? The plumbob needs to be above the babies head and then you click on the baby to get the option to play with the soft food and an adult needs to click on the fridge. Every time I try to make my baby follow obsessively or whatever she never finishes that task and the bar that tells her how long it has been never moves and if it does it stops at a curtain point. Why can’t my baby do this?